Which Eggs Are Suspected of Salmonella? Updated 3:18 p.m. EDT, Aug. 20 | Another Iowa farm is recalling eggs due to the potential to be contaminated with salmonella. Hillandale Farms said that it was recalling its eggs after lab tests confirmed illnesses associated with them. The company did not say how many eggs were being recalled or if it is connected to Wright County Egg, the farm that recalled 380 million eggs earlier this week, but an FDA spokeswoman told The Associated Press that the two recalls were related. Eggs affected by this recall were distributed to grocery distribution centers, retail grocery stores and foodservice companies which service or are located in fourteen states, including the following: Arkansas, California, Iowa, Illinois, Indiana, Kansas, Minnesota, Missouri, Nebraska, North Dakota, Ohio, South Dakota, Texas, and Wisconsin. There have been laboratory-confirmed Salmonella enteritidis illnesses associated with the shell eggs; the investigation is ongoing. Eggs are distributed under the following brand names: Hillandale Farms, Sunny Farms, and Sunny Meadow in 6-egg cartons, dozen-egg cartons, 18-egg cartons, 30-egg package, and 5-dozen cases. 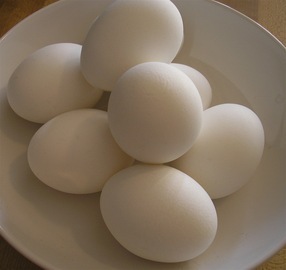 Loose eggs are packaged under the following brand names: Wholesome Farms and West Creek in 15 and 30-dozen tray packs. The loose eggs may also be repackaged by customers. Original post | Have you checked your eggs lately? The FDA is warning of a salmonella outbreak in some egg shells. 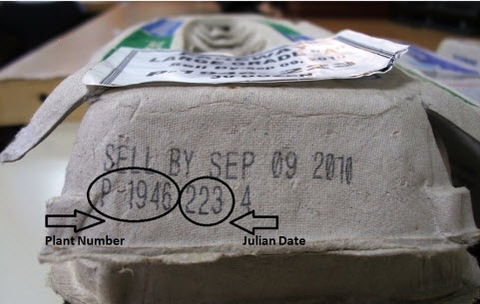 On the side of the carton, check the dates and where your eggs came from. One way to tell whether they were from the Wright Egg Farm in Iowa is to look for a letter number combination such as P-1026, P-1413 or P-1946. That indicates your eggs came from one of the plants they suspect produced the tainted egg shells. The dates in question are May 16 – Aug. 13. If the dates aren’t spelled out in plain english, they could also be listed according to a Julian calendar meaning the day of the year the eggs were processed. The tainted eggs would be in cartons with numbers between 135 and 229. If your eggs match these brands and dates, take them back to the store for a full refund or or call Wright County’s toll-free information line: 866-272-5582, which contains a message with recall instructions for consumers. You can also check online at Egg Safety Center.